Do untouched, unrecognised and uncovered places in nature still exist in Slovakia? And if so, how do we use their natural potential whilst still preserving their natural values? There are a series of discussion meetings in Slovakia currently “A Chance for Nature, A Chance for the Region“. These are about natural tourism and what a positive impact its development can have on Slovakia. The discussion meetings are for professionals and also for the general public. The aim is to exchange experiences and insights to the current state and development of natural tourism in Slovakia, the creation of partnerships and the searching for effective solutions for the benefit of the regions. 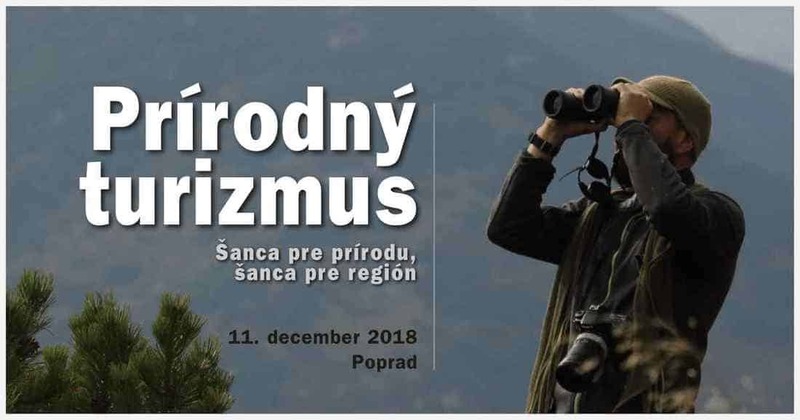 Together with the guests, they will discuss “friendly” outdoor recreation, why it is advisable to go into the Wilderness with a guide, how natural tourism works abroad and whether renowned tourists can help save Slovak nature from devastation. This series of presentation meetings on natural tourism in Slovakian cities is organised by Aevis Foundation. This is just one activity of the project “A Chance for Nature, A Chance for the Region “. Vlado Vancura, vice-chairman of European Wilderness Society, is speaking at the meeting on 11 December at 17:00. Join and discover the possibilities of exploring a wild Slovakia, without harming the landscape. Natural tourism does not leave a permanent ecological footprint and it does not erode the characteristic atmosphere of the landscape. It is a way for local communities to support themselves, and is a suitable alternative to mass tourism, timber extraction, and other activities for example, which have been damaging natural values ​​of the area. Natural tourism is particularly suitable in protected areas. There is also great potential in areas that have not yet been destroyed by the effects of mass tourism, as well as in economically developing regions, which are exceptionally rich in their natural and cultural diversity. More can be read here (in Slovakian). Representatives of the Aevis Foundation believe that the natural tourism brings us back to nature and helps us to appreciate our beautiful planet. It is an opportunity to preserve the amazing and unique diversity of nature and various regions of Slovakia. At the same time, it is also possible to make more efficient use of natural resources, improve employment and increase local self-sufficiency. Natural tourism is a chance for nature and a chance for regional development to coexist. Prírodný turizmus, šanca pre prírodu, šanca pre regióny (Natural Tourism, A Chance for Nature, A Chance for the Region) brochure in a very attractive and simple way explaining why natural tourism is important. This brochure supports the presentation meetings happening next week and provides background to the topic. The importance of natural tourism is not so much for nature or Wilderness itself, but much more for people. Visiting nature and experiencing Wilderness, leaves something in humans which is difficult to describe but creates motivation to return.